During our time on JET, we have been paying into the Japanese pension system. After we leave JET, we are eligible to receive a portion of this money back. There are two payments we are eligible for: the Pension Refund and the Pension Tax Refund. Although we are eligible for these, you will not receive them unless you follow the following instructions. Choose a person you trust who is staying in Japan to be your Tax Representative. This can be a coworker, your supervisor, or a close friend. Do not assume anyone will do it without asking. You are responsible for finding a person and ensuring that they agree to be your Tax Representative. Get the “Declaration Naming a Person to Administer the Taxpayer’s Tax Affairs” (「所得税・消費税の納税管理人の届出書 – (shotokuzei/shohizei no nozei kanrinin no todokedesho) from your local tax office (either a Social Insurance Office or the Tax Section of your Municipal Office). Fill it in with your Tax Representative and bring it back to your local tax office. Your local tax office may have a different form with English. Make sure you have your Pension Book. This is the little blue book you received from your supervisor at the beginning of your contract. 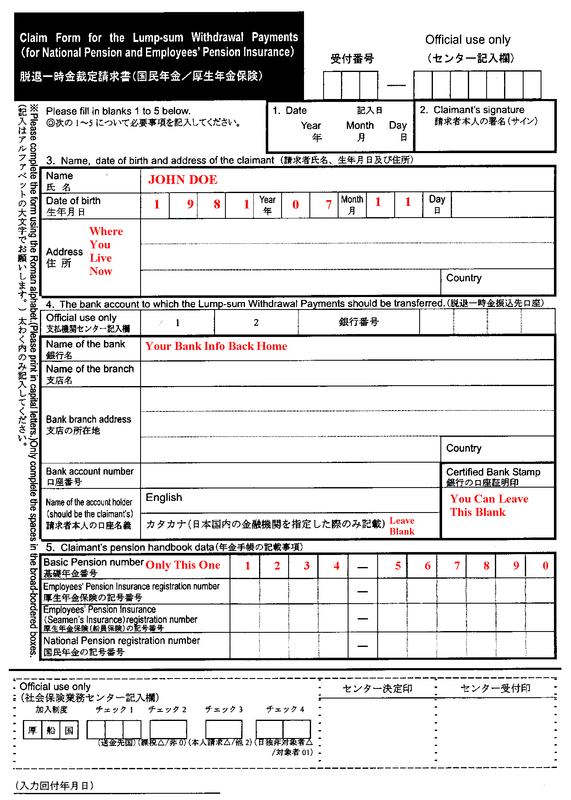 Download the “Application for the Lump-sum Withdrawal Payments” (脱退一時金請求書 – dattai ichijikin seikyusho) and have someone help you fill it out. 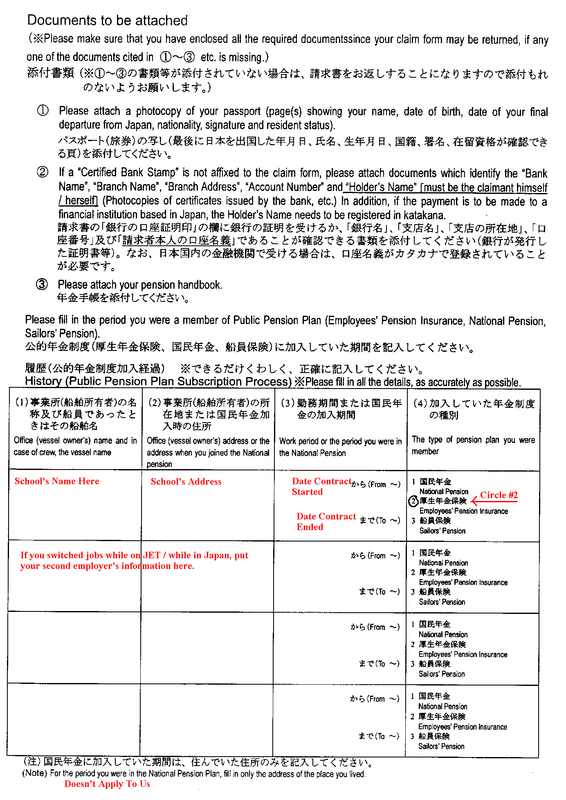 The form can be downloaded from the Japan Pension Service webpage. This form also goes by the name of “Request of Arbitration for Lump-sum Withdrawal Benefit” (or other similar variations). Submit a Tenshutsu-todoke (Moving-out Notice) to your municipality. Passport Photocopies of the pages showing your name, date of birth, nationality, signature, work visa, and the date of departure from Japan. A document (copy of your bank statement, bank passbook, etc.) verifying the bank name, branch office name, branch address bank account number, and the full name of the account holder (must be your own). You will receive the “Notice of the Lump-sum Withdrawal Payment” in the mail and the Pension Refund in your bank account. You can now file for the Pension Tax Refund. PLEASE NOTE that once you mail in your documents to the Japan Pension Service, it will take several months to receive the Pension Refund. Hyogo AJET suggests that you mail in the documents as soon as possible after you arrive in your home country. Make a copy of the “Notice of the Lump-sum Withdrawal Payment” and send the original to your Tax Representative. Have your Tax Representative go to the same tax office as before and file the kakutei shinkosho for you. They can go in person, or do this through the mail. The Tax Representative will receive your Pension Tax Refund in his or her bank account. This will take up to two months. Your Tax Representative will then be personally responsible for sending this money to you. The Pension Refund you get back initially is actually around 80% of your pension – what is left after taxes are subtracted. The remaining 20% are returned when you file for the Pension Tax Refund. In order to receive the refund, you MUST submit a moving-out notice to your municipality and also inform the immigration officer at the airport that you are leaving the country permanently. Application for the refunds must be made within two years of leaving Japan. This information has been updated as of April 30, 2014, according to information available on the Jet Programme Website.